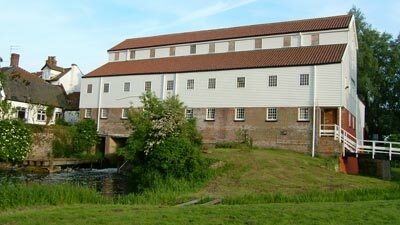 Stoke Holy Cross watermill was built of weatherboard over a brick base with a pantiled roof. The water had a fall of 12 feet to power the two breast shot wheels and unusually a wooden chute served to carry the water away from the foundations. 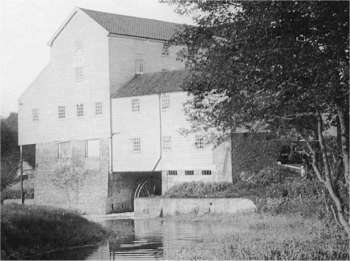 When milling corn, the wheels were driving seven pairs of stones, which made the mill one of the largest in the county. This was one of only a few mills in Norfolk to have the stones driven from the spur wheel set above them - five stones from one spur wheel. Stoke Holy Cross watermill is on a very old site, possibly dating back to Roman times and is quite close to the Roman fort at Caistor_St._Edmund. It was mentioned in 1482. A mill on this site was burnt down in 1744 and rebuilt in 1747. In 1746 Abraham Caught jnr., paper maker, son of Abraham Caught snr., deceased and William Largent, paper maker and wife Mary, daughter of Abraham Caught snr., deceased, conveyed the mill to James Denny. On Thursday died Mr. Denny, Proprietor of the paper mills at Stoke, near this city. 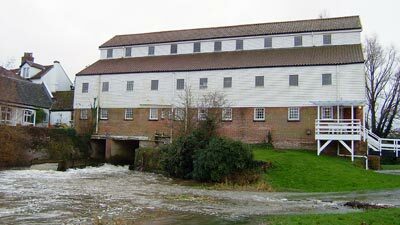 in 1778 James Denny's exector Henry Cooke, gent., leased the mill for 21 years to Ralph Buck, the lease being assigned to George Watson, gent., in 1788 and to Thomas Skelton in 1794. 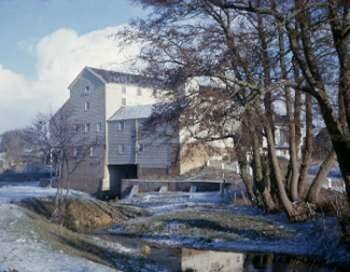 In 1814 Daniel Ames, gent., leased the mill for 21 years to Jeremiah Colman, flour merchant, who covenanted to leave the water wheel, pit wheel, French burr stones and boulting mill in situ at the end of his term. 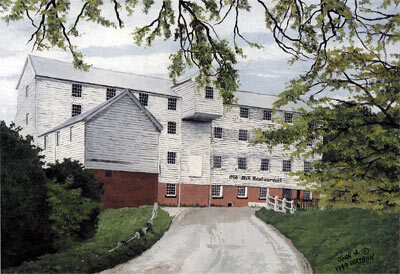 For many years the mill was worked in conjunction with the adjacent tower mill at that was built by Jeremiah Colman. The windmill drove four pairs of stones. 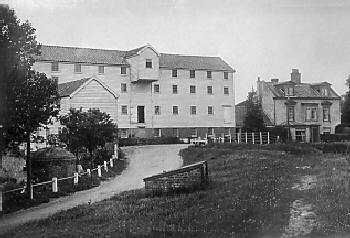 In March 1804 purchased smock_mill on eastern side of Magdalen Road, Pockthorpe, Norwich, near Silver Road. 1st August 1826 married MARY BURLINGHAM at Old Buckenham. MARY, born at Great Ellingham 24 October 1805, daughter of JOHN & MARY BURLINGHAM of Old Buckenham. In about 1856 the firm of J. & J. COLMAN began to transfer their mustard business to Carrow Works, Norwich, the transfer being completed in 1860. 17 May 1862, JEREMIAH JAMES COLMAN, trading as J. 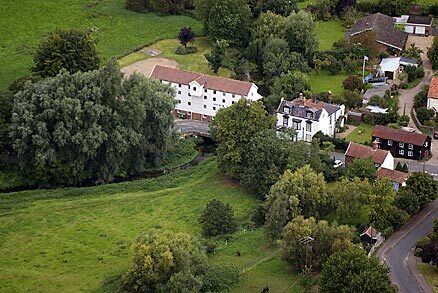 & J. COLMAN bought Old_Buckenham_Mill and property from JOHN & GEORGE BURLINGHAM (MARY's brothers) and HARVEY & HUDSON, bankers Norwich, their mortgagees. 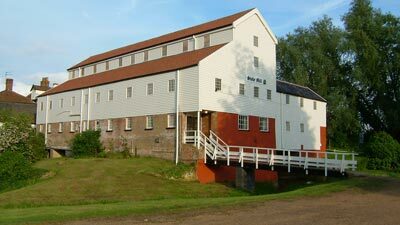 Deeds of Stoke Mill, described in 1766 as capital messuage with paper mill, barn, stable, drying houses, mill houses, shop, offices, etc., messuage called the Gatehouse with farm in Stoke and in 1825 as messuage and water mill with drying kiln, counting room, outhouses, water wheel etc., windmill lately built by Jeremiah Colman, two double cottages, and land cont. 22a. 2r. 35p. Settled in 1766 before marriage between James Denny, gent., and Sarah Dyball, spinster, with two messuages, land etc. in South Elmham St Margaret and Flixton, Suffolk, and 1767 conveyed to Henry Cook charged with payment of annuity to Henry Samuel Cooper, clerk. 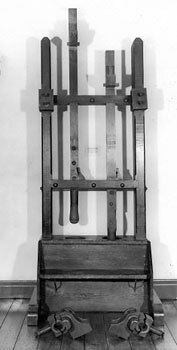 In 1791 Henry Cook conveyed to Thomas Cook and in 1795 Thomas and Henry Cook and their wives conveyed it in trust for Daniel Ames, with assignment of machinery inc. paper engine and presses. 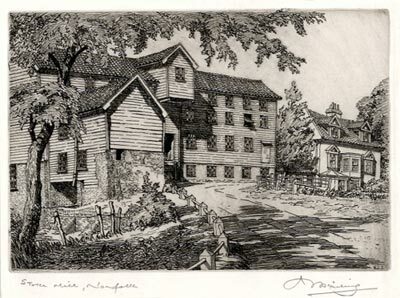 In 1825 Ames' devisees conveyed it in trust for Jeremiah Colman, who in 1825 mortgaged to Samuel Bignold, Esq., In 1841 Jeremiah Colman, miller, sold to Robert Kellett Long, Esq., messuage, water corn mustard and oil mills called Stoke Mills, windmill, starch house, millhouse, drying kilns etc., six cottages and lands (described) in Stoke Holy Cross. Docs. include conveyance of 1768 from Richard Baker, Esq., and Richard Porter, gent., and wife Sarah to Henry Cook of 2a. 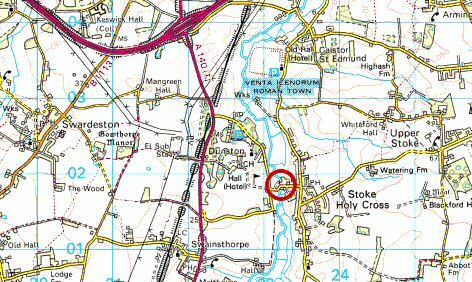 in Stoke part of the demesne of the manors of Shotesham Hall Swans and Toft Hall, plan in conveyance of 1825, schedules of gear of 1833 and 1841, and conveyance from Edward Barnes, sen., and Edward Barnes, jun., to Revd R.C. Long of 1a. 2r. 38p. in Stoke Holy Cross occupied by Jeremiah Colman, allotted under Poringland etc. Inclosure, with conveyance in trust from Edward Barnes, sen., to Edward Barnes, jun., schoolmaster, of all his property in Stoke and household and farming stock in consideration of debts, 1828, and notice under Poringland etc. Inclosure, 1805. In 1814 Daniel Ames, gent. leases for 21 years Stoke Holy Cross watermill to Jeremiah Colman, flour merchant. Colman covenanted to leave water wheel, pit wheel, French burr stones and boulting mill at the end of the term. Jeremiah Colman borrowed £6,000 from Samuel Bignold in 1825 (mortgage giving him a Bond for the further securing of that sum. In 1841 Jeremiah Colman, miller sold the property to Robert Kellett Long, Esq. 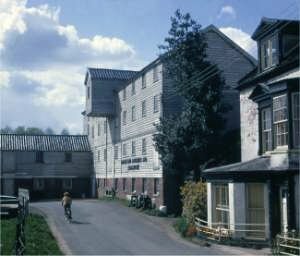 as 'Messuage, water corn, mustard and oil mills called Stoke Mills, windmill, starch house, Mill House, drying kilns etc. 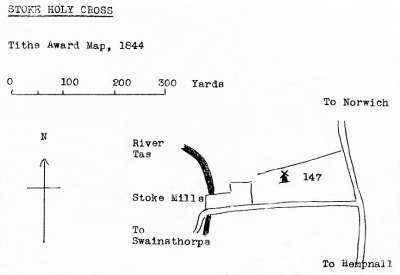 six cottages and lands in Stoke Holy Cross. However, the firm carried on as tenants until 1862. The mill had 7 sets of stones instead of the usual 4, although it is possible that the second wheel was being used to drive at least two of them. Unusually, the spur wheel was situated above the stones and thus also provided the drive from above. This meant that the drive did not have to pass through the bedstone as was usual. 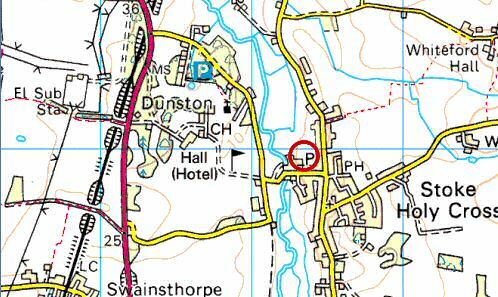 The only other Norfolk mills found to share this arrangement so far are Hunworth, Snettisham, Thornage and Weybourne. 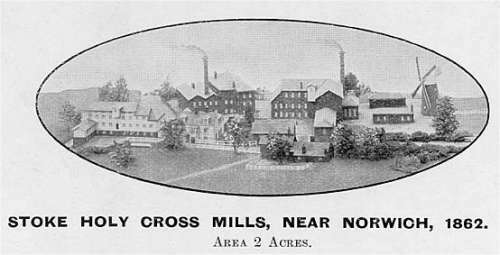 After the death of James Denny, Edward Ames became the owner and he closed the mill on two occasions. The first was as the result of a child drowning in the river, which seriously upset Mr. Ames. However, he reopened what was a flour mill as a paper mill. Later, the visit of a revenue officer, to assess the amount of tax to be paid, so angered Mr. Ames that once again he closed the mill. 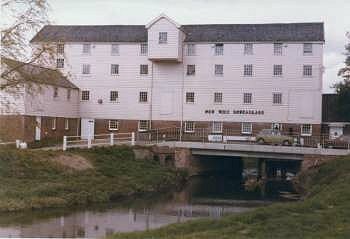 A Mr. Wright, of St. Helen's, Norwich, a manufacturer of bombazine and other articles, finally persuaded Mr. Ames to reopen the mill as a mustard mill. Mr. Wright claimed to be the originator of mustard making and was distantly related to Mr. Ames. 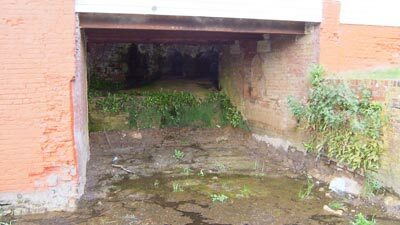 On 3rd April 1814, Jeremiah Colman of Pockthorpe_towermill, leased Stoke Holy Cross watermill as a going concern and paid £51 2s 0d to Edward Ames for his stock of mustard. Having taken the Stock & Trade lately carried on by Mr. EDWARD AMES, respectfully informs his Customers & the Public in general that he will continue the Manufacturing of MUSTARD; & he begs leaver to assure those who may may be pleased to favour him with their orders that they shall be supplied in such a manner as cannot fail to secure their approbation. 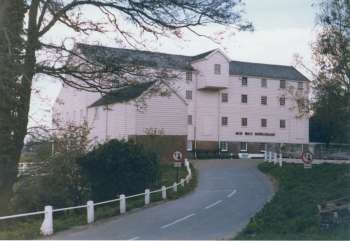 Thus began the mill's most prosperous 50 year period as Colmans' increased their range of products with the introduction of starch manufacture. Jeremiah Colman was originally a farmer and had also owned Bawburgh_Mill and a windmill outside Magdalen Gates. He had no son and adopted James who was the eldest of his brother Robert's 15 children. The present Colman family of Norwich are descendants from James. Jeremiah was a devout Baptist, kindly, honest and a good master. 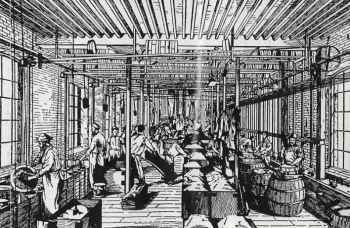 Under his ownership between 1814 and 1850 wages at the mill rose from 8/10½ to under £1. Boys of 8 or 9 worked 12 hour shifts with 2 breaks and earned 3d per hour. A working day was normally 6.00am to 6.00pm although sometimes a shift could go on until midnight. Many workers then faced a long walk home. The Colman family took a benevolent interest in their workforce by supplying schooling and contributing to the social life of its staff e.g. Christmas dinner in the granary and staff outings. The company was one of the first to offer a meals service for its workers - four pence bought hot meat, vegetable stew and a pint of coffee. Colman's also provided a clothing club and lodgings for working girls, followed by a lending library and a pension fund. In 1878 the company employed the first industrial nurse, Philippa Flowerday. In 1830 the company began to manufacture starch from wheat. In 1834 James Colman was still personally mixing and sifting mustard flours at rush times. His wife and daughter also helped to label the casks. A one armed man was doing all the packing, which at this time was into casks and bottles. In 1845 the first steam engine was installed. Until that time one waterwheel worked 5 pairs of stones and the other worked a battery of stampers to pulverise mustard seed. The company had by now also built a windmill close by to supplement grinding power whenever necessary. Until 1847, when a railway station opened at Swainsthorpe consignments of mustard bound for London were in the charge of John Wright. John operated 5 waggons and even invented his own Tally Stick methods. Railway transport eventually took over and trains brought in the mustard seed and took away the finished product. In 1850 tins were introduced for the first time and soon took over from the casks. In 1851 the founder Jeremiah Colman died. Later on James' son J. J. Colman (photo below) took over sole charge to run the company. In 1853 White's Directory records that "An alarming fire broke out in a spacious room used for drying starch at Messrs. Colmans' premises, and but for its timely discovery, a far larger work of destruction would have taken place. The application of a quantity of chlorine liquor had a great effect in stopping the ravages of the fire but the building was considerably injured and twenty tons of starch seriously damaged. The estimated loss £1000." 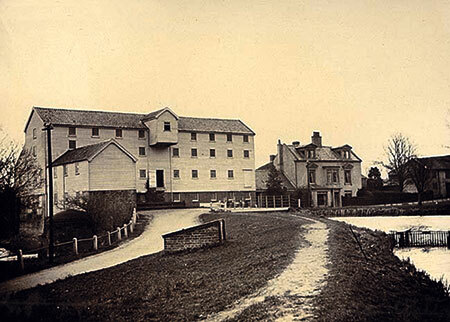 In 1862 the lease ended and by now the business was too large for Stoke Holy Cross Mill. Thus Colmans moved to the present site at Carrow. In October 1860, Thomas_Smithdale agreed to make some new machinery to William_Thorold's plans and specifications. Agreeable to your request I beg to say I am willing to make & fix at Stoke Mills one set of Stone Pans, with Wheels, Governors & connecting Shaft &c. &c. for do. Also hang one pair of Friction Wheels on Horizontal Shaft and Stone Spindle according to plan and Specification. The Work to be done in a Workmanlike Manner for the sum of fifty pounds. 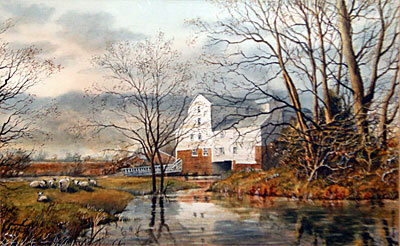 STOKE MILLS. Four miles from Norwich, where for many years a large and lucrative trade has been carried on by Messrs. J. & J. COLMAN, Mustard & Starch Manufacturers & Millers. The Premises comprise a Capital RESIDENCE with Entrance hall, Breakfast, Dining & Drawing rooms, 8 Bedrooms, Kitchen, Brewhouse & other Domestic offices. A WATER CORN-MILL containing four floors, driving seven pairs of French Stones; three Flour Mills with Wheat floor, Stage & Stowage. A WINDMILL driving four pairs of Stones with all machinery, stairs, ladders, wheels, pulleys, tackle & going gears to the same respectively. A STEAM-POWER MILL with four floors driving four pairs of Stones, two Counting houses with Bedrooms over, loose Horse boxes, Riding & Cart horse Stables, Chaise houses & Waggon lodges, extensive Warehouses & Store rooms, Blacksmith's, Carpenter's & Cooper's Shops, several Cottages & Outhouses, Barns & 22 acres of Arable & Pasture Land attached. The attention of Capitalists is respectfully called to the above. For terms apply to Mr. NEWTON, Land Agent, Norwich. On 17th May 1862, J. & J. Colman bought Old Buckenham towermill from John & George Burlingham and their mortgagees Harvey & Hudson..
"now forming the Steam Flour Mill with several other extensive Buildings, the Stabling, 8-bay Cart lodge and other Erections now to be sold and taken down." Mustard is made from the seeds of plants of the Brassica (cabbage) family which are grown mainly in the eastern counties of England. Two kinds are used - one yielding brown seed, the other white. At the factory they are milled separately but in exactly the same way. First the husk is broken on rollers to release the kernel. Next the husk and kernel are separated in a purifier using sieves and currents of air. The kernel then passes through further rollers which progressively reduce it to a fine powder. For ready mixed or prepared mustards other ingredients are added and the mixture packed into jars. In the days at Stoke and up to 1870 the mustard powder was produced by a kind of mechanical pestle and mortar called a 'stamper' and the resulting flour sifted out on 'frames' fed by hand. Jeremiah Colman was still personally sifting his own mustard flour after twenty years at Stoke Holy Cross. In the Bridewell Museum in Norwich one of these early 'stampers' once used in the commercial preparation of mustard can be seen. As far back as 1878 the farmers of the Fen country who grew mustard crops would take samples of the seed in small home-made canvas bags to the company's agent who on three successive Saturdays in October held a market in Dawbarn's shop in Wisbech. The sample would be inspected, a price offered and a bargain struck. The crop would then be delivered to Colmans in sacks by rail. Today mustard is still grown by farmers on a contract basis. Specially selected seed is supplied to them together with advise on cultivation. After harvesting the entire crop is bought by Colmans. Much of the seed milled in Norwich is grown in the eastern counties of England, and you may have seen the brilliant yellow fields of flowering mustard towards the end of June. The seed is harvested in August and delivered to Carrow by the growers. The one armed packer mentioned above was reputed to be one Lazaris Horne who had lost his arm fighting in a war in the USA. 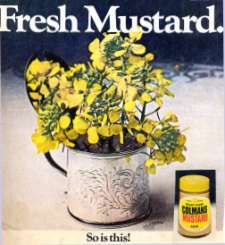 James Colman was in reality the son of Robert Colman but he was the adopted by Robert's brother Jeremiah, the famous mustard company's founder. James Colman married Mary Burlingham, daughter of John Burlingham of Old Buckenham in 1826 and they had a son, Jeremiah James Colman, born on 14th June 1830. J.J. Colman became a partner in the business at Stoke Holy Cross with his adopted father in 1851 and from then on the company was called J. & J. Colman. Jeremiah James was responsible for moving the firm to the larger works at Carrow in 1856 and by 1893 the company had over 2,000 employees. An unswerving Liberal, he was nevertheless trusted by the Conservative party. He served as a councillor from 1859 to 1871 becoming Sheriff in 1862, a City and County magistrate, Deputy Lieutenant in 1880 and an Alderman in 1896. By the time he stood for parliament in 1871 he was Leader of the Liberal party in the City. In 1880 he stood for parliament again. In 1885 he lost his seat to Henry Bullard but regained it in 1886. When speaking at Westminster his oratory was known for its fluency rather than its frequency. He served as Governor of Norwich School in 1858 and as its Chairman in 1890. He was a trustee of the Municipal Charities in 1856 and its Vice-Chairman from 1869 - 1872. In 1893 he was made an Honourary Freeman of the City. A champion of nonconformity, he persistently urged religious freedom. His generosity, unvarying kindness and courtesy, enlisted the support not only of his business colleagues and employees but made him beloved by all who came into contact with him. In 1856 he married Caroline, the daughter of William Cozens-Hardy of Letheringsett Hall. February 15th, 1823 , was a significant date for Norwich and Norfolk. It was the day when Jeremiah Colman took his nephew James into partnership. Thus began the J. & J. Colman business which was to have such a beneficial effect, not only on the life of city and county, but farther afield. This partnership of Jeremiah and James forged what is locally the strongest link in the chain of events leading eventually to a change of the greatest importance to an agricultural region - the efficient processing, packaging and distribution of foodstuffs by industrial methods. This summary, writes Ken Holmes, our industrial editor, of the growth of what is now a worldwide business has been compiled with the aid of records and research by Dr. S. H. Edgar, who was at Carrow from 1929-1968, and was nutritional adviser. Some of the earlier references are taken from articles written by the late E. B. Southwell, director and general manager early this century, who joined the firm in 1975. Jeremiah Colman had been a flour miller near Magdalen_Gates since the early part of the 19th century. 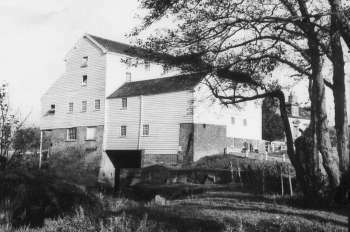 In 18143 he leased the mill at Stoke Holy Cross, and having to choose between paper-making, flour-milling and mustard, which had all been carried on there, decided to concentrate on the last. Old Jeremiah, as he was called, had no children. His brother Robert, farming at Rockland St. Andrew, had 15. Eleven of them were boys. So Old Jeremiah adopted the eldest of these brothers, James, and when he was 22 took him into partnership. James began with a quarter share which was increased to one-third in 1827 and half in 1831. Late4r on two of the other brothers, who represented the business in London, Jeremiah II and Edward, were also admitted into partnership. But this was not until 1844, six years before land was purchased at Carrow. With James sifting and mixing the mustard flour obtained from the crushed seed, and Old Jeremiah starting his day's work at 7 a.m., an hour after the men, the business prospered. Wheat continued to be ground and in 1830 the manufacture of starch was begun. The size of the business at that time can be gauged from the records of a member of the Colman family recalling his boyhood memories of around 1834. He watched one man, Lazarus Horne, who had only one arm, doping all the day's packing himself. Wooden casks were the only containers then used for mustard flour, apart from a small amount of the powder put in bottles for export. Starch was also manufactured at Stoke, and by 1852 the firm was advertising mustard in casks, tinfoil packets and round tins; several types and different packages of starch; and indigo and Prussian blue for launderies and manufacturers. This was the year after the founder, Old Jeremiah, dies and Jeremiah James, son of James Colman became a partner. A few years later James died, and Jeremiah became the sole partner at the production end of the business in Norfolk. Jeremiah James is the father of Carrow. He was responsible for the move from Stoke and the industrial approach to what had been previously been large-scale milling operations. The decision to leave Stoke was brought about because of uncertainty about the renewal of the lease, and the obvious advantage of working near to river and rail transport. The mid-19th century was a time of great poverty in Norwich following the dwindling of the textile industry. Land was cheap and labour plentiful - and cheap as well. 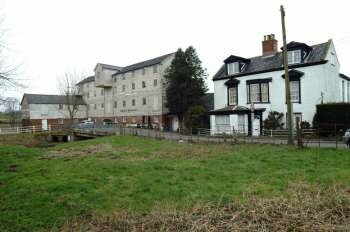 The grounds of the historic Carrow Abbey were selected at the site, and without planners to satisfy, the first mustard mill was working in 1854. 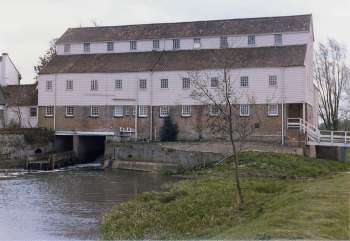 Before long, flour and mustard mills began to appear along the bank of the river, with engine houses, granaries, and stores. By 1857 the Counting House, still identifiable, was built for use as the administrative headquarters. Production continued both at Stoke and Carrow until Stoke was relinquished in 1862. After their marriage J. J. Colman and his wife Caroline made their home at Carrow Abbey, where they remained for 40 years with the head of the growing company able to give personal supervision daily to the business at the bottom of his garden. The Colman family had always been in advance of their time in recognising the need to look after the welfare of their employees. Even the wife of James Colman organised a clothing club at Stoke in the very early days. It was the mo0ve to Carrow and the great and rapid expansion of the business which accelerated the provision of social welfare for employees on a scale not seen in the neighbourhood before. In 1857 Carrow School began with 22 children in an upper room in King Street. No better indication can be given to the growth of Carrow Works than the fact that when the State took over responsibility for education in 1870, and continued in partnership with Carrow, there were 324 children on the register. While this is primarily a sketch of the industrial development of Colmans to indicate what has grown from the seed of mustard, it cannot be separated from from the pioneer concern for the welfare of employees which had a part in the overall success story. A meals service in 1868, a dispensary in 1864, schooling and a care for employees outside their working hours contributed to the remarkable growth in Norwich of this country milling firm. The area near the factory, Lakenham and Trowse became Carrow enclaves and the people who worked at Carrow were proud to do so. Behind it all was the patriarchal figure of Jeremiah James Colman of Carrow House, who extended his care for Carrow to the life of the city of which he became Mayor, and for 24 years its Member of Parliament. When he died in 1898 there was grief throughout the city. Twelve hundred workpeople from Carrow attended the funeral - an extraordinary large labour force considering that no new products were introduced at Carrow in the 19th century, and the fame of the firm rested primarily on its mustard, followed by starch and blue. The growth of the business rested on the increasing nationwide and world-wide demand for the limited ranges of its quality products, and on what today would be known as good marketing. The selling and marketing was carried out by two other branches of the Colman family originating from the brothers Jeremiah and Edward, and carried on through their sons and grandsons from the Cannon Street offices in London. Continuing the family tradition of taking members of the family into partnership, the London branch's Jeremiah Colman III became a partner, and in Norfolk Mr. Russell James Colman, son of Jeremiah James. They were the last of the partners. In 1896 an important change took place in the structure of the firm when the partnership became a limited company with a capital of £1,350,000. The first chairman was Jeremiah James, who was succeeded after his death two years later by one the London cousins, Frederick Edward Colman. When he died at the turn of the century, he was succeed by Jeremiah, later the first baronet, of Gatton Park, Surrey, who remained chairman for 42 years. But this is the time when the contributions of members of the family in this and succeeding generations - not forgetting that of Professor James Stuart, married to Jeremiah James' daughter Laura - were being augmented by those of management specialists. Another attribute of the Colman family appears to be that in addition to winning the loyalty of their workpeople they had a flair for attracting good managers. In the late 19th century the names Samuel Harvard, Robert Haslewood and Charles Burlingham were synonymous with Carrow. Later were another famous couple of names, Newman and Beales. Coming to more recent times it would be invidious to name names, but there are undoubtedly a number of very capable men in different fields of business who have held executive posts at Carrow contributing handsomely to the building up of the present business giant. The growth of the country milling business in 150 years has not come about solely by the introduction of new products, methods of manufacture, and increasing sales. These have played their part directly, but also indirectly by creating the means for taking over competing firms. This policy of expansion by acquisition is no recent innovation. It appears to be as old as the 20th century, for it was in 1901 that a rival starch-making firm of Orlando Jones & Co. was absorbed. Two years later, principally interested in their competitor's mustard and spice trade, Colmans took over Keen Robinson & Co., but found they had become one of the most important baby-food manufacturers in the country through sales of Robinson's Patent Barley and Patent Groats. The period up the the first world war marks the continued transformation of Colmans from a paternal 19th century business employing a great deal of labour, and relatively little mechanised, to one using mechanical processes tending towards automation, and backed by the different financial approach of the limited company. Evidence of change comes in the appointment in 1913 of the first non-family director, Mr. E. B. Southwell, who as general manager had carried out the long and difficult negotiations for the acquisition of Farrows of Peterborough. The Farrow acquisition brought new products such as dried and packeted peas, salad cream, tomato ketchup, sauces, canned vegetables and fruit. Another noteworthy change during this era - though the full significance was not to be recognised until 25 years later - was the setting up in South America of a joint trading company with Reckitt & Sons Ltd., called Atlantis Ltd. The war was a difficult period, with no fewer than 921 employees serving in the forces. The depleted directorate was strengthened by the return in 1916 of Mr. Geoffrey Colman, eldest son of Mr. Russell Colman, invalided out of the Army after a long convalescence from a dangerous wound. Despite all the difficulties, the closing months of the war saw close on 2000 men and women employed at Carrow - a workforce which at that time saw the innovation of an eight-hour day, a 48-hour week, an annual holiday, and a works council. Immediately after the war new products started to be introduced - porridge oats for quick cooking, and a complete baby food to be mixed with water, marketed under the name Almata. The making of the baby food, and subsequently the control of its quality, demanded scientific handling of a different kind from that of the mill products. This led to the setting up of the research laboratory. The 1920s were a time of consolidation and improvement of the products, to be followed in 1936 by expansion into the manufacture of soft drinks, the link between Colmans' cereal based products and fruit juices being the patent barley used to make barley water quickly. Robinson's lemon barley water was the parent of what was to prove an expanding range of soft drinks. Colmans had become a public company in 1936, and two years later, in 1938 joined forces with Reckitt's of Hull to become Reckitt & Colman Ltd. The first association with Reckitts to trade in South America in 1913 had been extended for joint overseas trading elsewhere in 1921. Jointly they had bought the R. T. French Company of Rochester, New York, in 1926, which, amongst other things specialised in the sale of products for pet birds. Research for these was carried out at Carrow. The amalgamation was in the fateful year of Munich when, to all but the optimists, war was inevitable. Its outbreak in 1939 must have postponed changes bound to follow the amalgamation of the two large groups. Carrow Works was severely damaged by air raids during the war. One in 1941 destroyed four buildings including the cereal and mustard departments and a year later the seed granaries, starch, blue, Savora and advertising departments were blitzed. In 1943, six months after his son Alan had been killed while flying as a war-time ferry pilot, Mr. Russell Colman retired from the board. For the first time for 130 years there was no Colman on the Norwich branch among the directors. In the main the heavy burden of carrying on the business under the difficulties of wartime fell on the shoulders of Sir Basil Mayhew and Mr. H. A. G. Salter. While there had been a certain amount of building at Carrow between the wars the appearance of the works had changed little since the 19th century. But the war damage gave an opportunity for fresh thinking and replanning the layout. The immediate post-war years saw the marketing of the firm's modern series of ready-cooked infant foods, and work on other buildings at Carrow in addition to the replacement of war damage, notably a giant silo and a new flour mill. In 1945 the Reckitt & Colman Group was joined by another large business, Chiswick Products Ltd., manufacturers of polishes and similar lines, building up towards today's world-wide range of foods, wines, soft drinks, household goods, toiletries, pharmaceuticals and industrial and other products. World-wide sales in 1971 were more than £192 million, producing a pre-tax profit of £19.8 million. In this large overall development, the former Colman business, which became the Reckitt & Colman Food Division, continued to have an important role. Probably the most significant developments of recent years were the acquisition in 1968 of the Norwich-based wine company Coleman & Co., long known for its tonic wine, Wincarnis. Because of the similarity of names many people thought that this was always a Colman product. 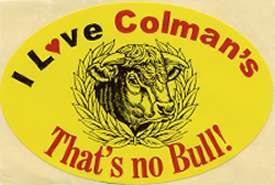 Until 1968 it was not, although a hundred years before Colmans bought up Colemans of Bury St. Edmunds, small mustard and starch manufacturers. The proprietor, Mr. W. J. Coleman, a chemist, then developed the tonic wine. Colemans had by this time become a considerable business as shippers and distributors of branded wines. Reckitt & Colman extended it by further acquisition of the business of Edoard Robinson and, in 1969, of Moussec sparkling wine, of which more than ten million baby bottles were sold in 1971. Moussec, for which there is an expanding trade, is now being made and bottled in Norwich, and with the growth of wine drinking as a natural complement to food, Carrow Works is now the home of the Food and Wine Division of Reckitt & Colman. A few years back there were fears - probably no more than unfounded rumours - that with the interplay of forces within big groups leading to rationalisation of manufacturing processes, Carrow might no longer be required. Happily this is no longer a subject for speculation. Carrow has become the group's food manufacturing centre, with the remaining lines of Farrows of Peterborough, including Gale's honey and peanut butter joining the Moussec plant as new developments on the Carrow site which still offers the opportunity of further expansion. When the Colman family picked the site around the old Abbey at Carrow something like 120 years ago, they were really looking ahead. Despite automation, computers, and mechanical processes not dreamed of by the early employees who put the mustard into large and small containers by hand, there are still 1600 employees of the Food & Wine Division in Norwich. Furthermore, the numbers employed are at present increasing slowly rather than diminishing. It is a point touched upon by Mr. James Cleminson, who came to Carrow in 1960, was appointed managing director of the food division in 1970, and is shortly to become chief executive of the £200 million parent company, Reckitt & Colman Ltd. He says it is appropriate that they should, on the 150th anniversary, acknowledge the debt owed to predecessors by opening a mustard shop in Bridewell Alley in Norwich. "I am sure, however," he adds, "that they would regard it as more important that we should maintain their progressive outlook for the future." In 1814 Daniel AMES, gent. 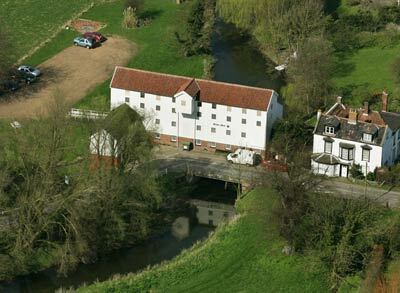 leased for 21 years Stoke Holy Cross watermill to Jeremiah Colman, flour merchant. Colman covenanted to leave water wheel, pit wheel, French burr stones and boulting mill at the end of the term. Jeremiah Colman borrowed £6000 from Samuel Bignold in 1825 (mortgage giving him a Bond for the further securing of that sum. However the firm carried on as tenants until 1862. No. 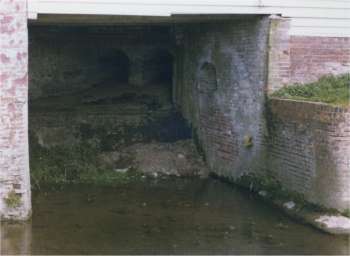 145: Part of Watermill, House, Yards etc. Pasture 0a. 3r. 32p. Messrs. J. and J. Colman, Stoke. I beg to hand you a price for a pair of new feed rolls the same size as the pair now at work at your Mill at Stoke. The rolls to be bored and turned. Two ham'd iron gudgeons four inches diameter turned to fit bearings & rolls and well keyed into Do. To make a new cast iron frame with all new bell metal brasses fitted to the same and bored to fit the gudgeons, two cast iron spur wheels to rolls, one spur wheel and pinion to drive the same with feed rolls will amount to Fifty Five Pounds. Your Obedt. & Hble. Servt. J. and J. Colman have a large mustard, starch, seed-crushing, and corn mill here, which gives employment to a great number of hands. On November 24th, 1853, an alarming fire broke out in a spacious room used for drying starch, on Messrs. Colman's premises; and, but for its timely discovery, a far larger work of destruction would have taken place. The application of a quantity of chlorine liquor had a great effect in stopping the ravages of the fire; but the building was considerably injured and twenty tons of starch seriously damaged. The estimated loss was about £1,000. Dr Sir, August 11th 1858. I beg to say the Price of One Double Hydraulic Press 4ft. 8in. between Columns and Rams by 3ft. with 12in. Diameter casing distance 8in. with 4 wrought iron Columns to each Press 31/8in. Diameter for working Pressure of 400 Tons each, with one set of Gun Metal Double Pumps 2½in. x 1in. Dia. Rams with Double stoppers Complete for the Sum of Two Hundred and Eighty five Pounds. Agreeable to your request I beg to hand you the Price for Three Single lift Hydraulic Presses 5 feet by 5 feet, with 9 inch Ram and 9 inch Lift with 6 Wrought iron Columns of 3 inches Diameter to each Press and one sett of Gun Metal Double Pumps 2½ inch and one inch Diameter Rams, with 3 setts of Gun Metal Double Stoppers and Stop valves complete for Working pressure of 100 Tons each, with connecting Pipes and Ram Leathers, the above to be fitted and finished in a Workman like manner as per Drawings and forwarded to Carrow Works for the Sum of Four Hundred and Fifty Pounds. £450. 0. 0. A Baptist Chapel was built here about 20 years ago by Messrs. J. & J. Colman, but it is now used as a kind of Chapel of ease, evening service being performed in it every Sunday by the vicar. Elijah Eglington, who ran the mill in the 1880s was born on 19th January 1828 at Gt Witchingham. He married Elizabeth Flarty (orig. Flaherty) in the June quarter of 1849 at St Olave Southwark in London and they went on to have nine children. Most of their Norfolk family had to be baptised in private because of the laws during the 17th, 18th and 19th centuries, which didn't favour Catholicism. Tobias William Pilch Beverley was known as William Beverley. He was born 1849 and married Harriet Henrietta Rackham in 1876. Harriet had died by 1901 and the census of that year recorded that Harriet's sister Emily was employed by William as housekeeper and was living in the household. In 1908 William Beverley married Emily Maria Rackham. 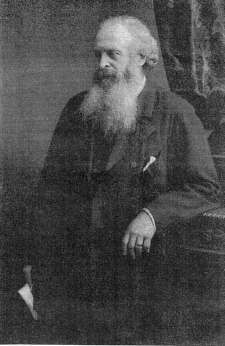 William Beverley died in 1910. 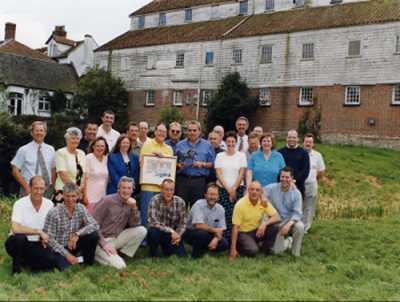 In August 1998, Keith Fowler organised a reunion of Colman's Mustard employees. Keith was a former head rollsman at the Norwich millers R. J. Read before moved across the river to join Colman's Mustard. He then worked through from the bottom to become manager of the mustard department where he remained until he retired. Back Row: Mark Dyble, Paul Setchell, Mick Bradford, Mike Farrow, John Wilson, Billy Nichols, Kevin Cooke, Tony Gotts, John Thurley, Mark Stone. Middle Row: Peter Eglington, Maureen Curson, Ingrid Nash, Karin Burley, Keith Fowler (manager with picture), Mick McGarry, Louise Wicks, Gillian Utting, Ian Rainford, David Lutkin. Front Row: Keith Hunt, David Pointer, Terry Bale, Mike Muscroft, David Perkins, Ian Boan, Tony Dye. Over the years the riverbed was damaged and scoured by a series of floods. Most notable were those in 1849, 1912 and 1968. The wheel was removed in about 1952 and the remainder of the machinery was sold off in 1963. John Crome painted a floral decoration on the ceiling of one of the rooms in the mill house. Colman's owned several wherrries including the Hero, Hope, Lucy, Plane, Star of Hope Walberswick and William. 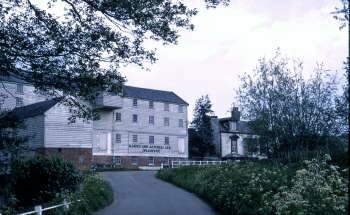 William Frederick Brock was part of a Norfolk milling family and was born in the mill house at Sprowston. 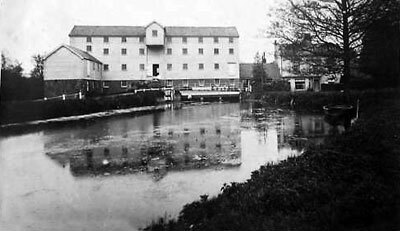 He bought Stoke Holy Cross mill and mill house in 1936. 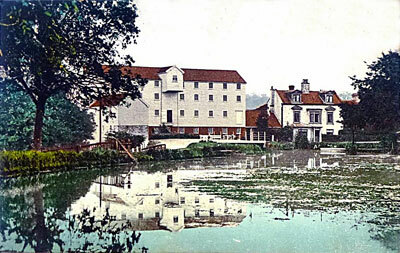 His father Henry Benjamin Brock ran Sprowston_southern_towermill from c.1890 until 1908, when he moved to Keswick watermill. 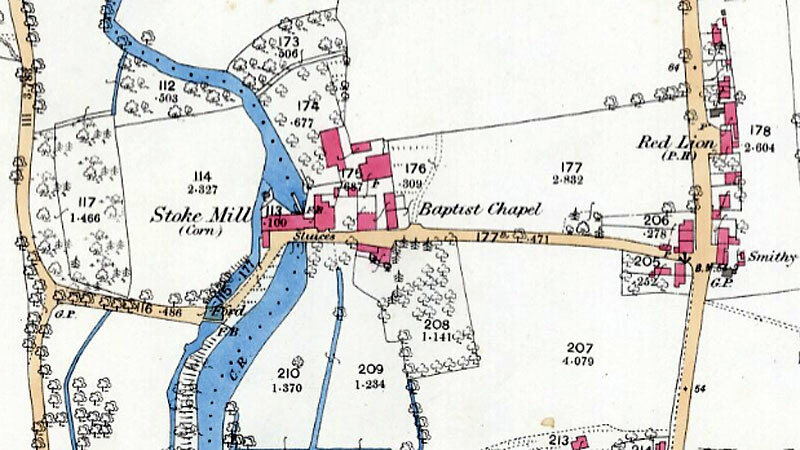 I thought you might be interested to know that the miller at Stoke Holy Cross in 1871 was Thomas Edward Wells, son of William Harrison Wells of Dilham and New_Mills. The Wells family are interlinked with my husband's family in a number of ways. Thomas Edward Wells' wife, Katherine Hicks Cross, is the half-sister of Eleanor Woodcock Cross, my husband's great-grandmother. Eleanor married Frederick St John. William Harrison Wells' grandmother (Mary Astley) was married to Oliver St John (Frederick 's great-grandfather) before she married William Wells. Mary's son by her first marriage (Thomas St John) then married his stepsister (William Wells' daughter by a previous marriage) to become the grandparents of Frederick St John. And just to confuse matters still further, Frederick 's maternal grandmother, also remarried into the Wells family, marrying William Harrison Wells' uncle Stephen! 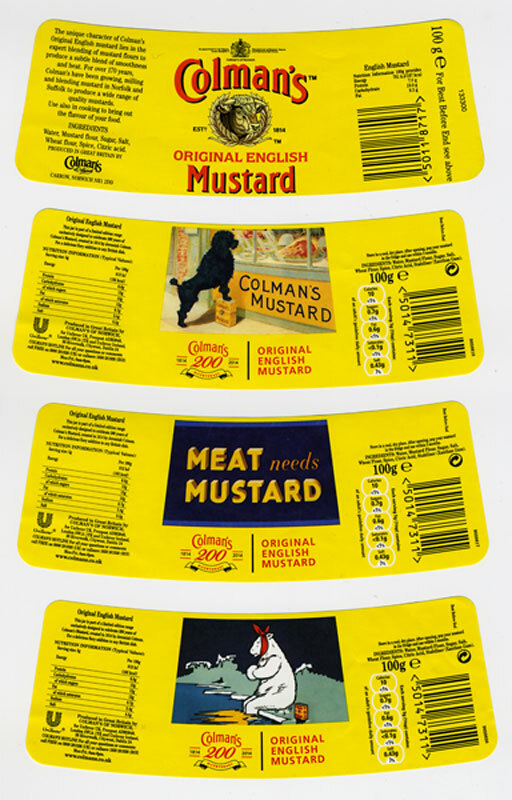 On 5th January 2018, Unilever announced that Carrow Works will close and all mustard production will move to Burton on Trent in 2019. 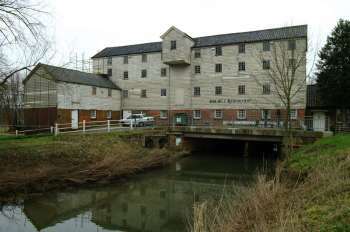 Mustard milling will continue at a new Norwich mill, allowing for the brand to retain the Norwich name. Here is a Baptist Chapel, built by Messrs. J. and J. Colman, who also support an Infant School. Baptist Chapel here was built by Messrs. J. and J. Colman, who also support an Infant School. 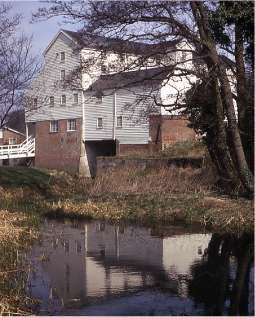 Mill owned by R. Kellett Long who lived at nearby Dunstan Hall and was a direct descendant of Charles II. The mill was run by W.H. Wills who was a miller and merchant. A Baptist chapel was built here about 40 years ago by Messrs. J. an J. Colman, but it is used as a kind of chapel of ease and reading-room, evening service being performed in it every Sunday by the vicar. A Baptist chapel was built here about 50 years ago by Messrs. J. an J. Colman, but is used as a kind of chapel of ease and reading-room. 1936: William Frederick Brock producing cattle food using 3 pairs of Derby Peak stones. He made food to individual requirements and different herds.